Kassandra Kay Banister, 73, rural LaFontaine, died at 2:32 p.m. Wednesday, June 22, 2016, at Lutheran Hospital, Fort Wayne. She was born April 15, 1943, in Peru, to Arol Clio and Ethel Mae (Ridenour) Frantz. Kassandra was a 1961 graduate of Anchorage High School, Anchorage, Alaska. She married John Weirs Banister, he survives. She was an LPN at the Wabash County Hospital retiring after 29 years. Kassandra was a member of the Wabash First Church of God. She enjoyed flower gardening, painting, camping, homemaking, and her family. 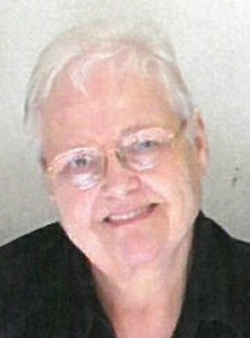 She is survived by her husband: John Weirs Banister, LaFontaine; four children: Beth (Randell) Wilcox, Wabash; Chris Gates; and Todd (Vicky) Gates, both of LaFontaine; and Chris (Dawn) Banister, Andrews; special adopted daughter: Phyllis Gilbert, Wabash; 14 grandchildren; 14 great-grandchildren; two sisters: Kandice (Robert) Rose, Wabash; and Kymber (Kevin) Bowman, LaFontaine; and her dog: Lucy. She was preceded in death by her parents; and her daughter: Laura Elizabeth Gates. Funeral services will be 2 p.m. Saturday, June 25, at Grandstaff-Hentgen Funeral Service, Wabash, with Pastor Robb Rensberger officiating. Burial will be in Center Grove Cemetery, Wabash. Friends may call 5-8 p.m. Friday, June 24, at the funeral home.